Do the WRITE Thing: 27 of 31: That's What Brothers Are For! That's what brothers are for! I had big plans tonight. I was going to go to the gym, grade, and squeeze in a little personal reading time. This was going to be my night. And then it rained and rained and rained. I have a basement that floods and four sweetgum trees in my yard that clog my gutters. If the gutters overflowed, a surge of water would appear underneath the drywall along the floorboards snaking its way to the drain in the unfinished part of my basement. So after a years of cleaning out the gutters every single weekend in the spring, I invested in gutter guards that cover the gutters allowing rain in but keeping gumballs and leaves out. They worked like a charm. I haven't cleaned gutters in over four years and couldn't be happier. Well, I couldn't have been happier until a couple years ago when my driveway settled a bit where it met the garage and water once again found its way in and down. During a particularly hard rain, water would race down the gentle incline of my driveway and create a pool right in front of the garage. As water so often does, it would find its way under the garage door and somehow seep down the wall and into my basement once again. 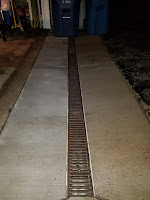 So after two such leaks, I invested in a contractor who removed a section of my blacktop and replaced it with a grated channel and beautiful concrete so that the water would be funneled away from the house and thus solve all our spring leaks. I couldn't have been happier. 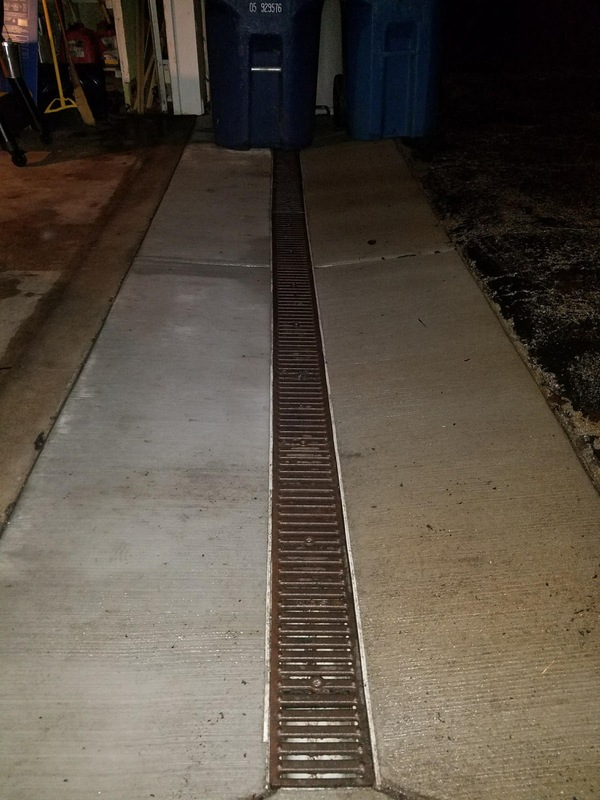 Well, I couldn't have been happier until I realized (too little, too late) that the grate covers would need to be unscrewed and removed in order to clean out the channel from time to time. When neglected for long enough, the leaves and grit accumulate to the point where a heavy rain would produce more water than the channel could handle. Did I mention it rained. All. Day. Today. And so water, inevitably ended up in the garage and back down in the basement, which was what I was greeted with tonight when I got home. So I called my big brother, and he graciously offered to help me clean out my grate. He even let me borrow his industrial size Wet Dry Vacuum so that I could get as much water out of the area rug as possible before starting the fans. His only response to my request, "Of course. That's what brothers are for." Thank goodness for my big brother. And lesson learned: I no longer have to climb a ladder to clean out the gutters; I just have to squat down to do it!